“Trashy romance novel” is an expression that’s so ubiquitous, it should have its own Wikipedia entry (I checked. Thank goodness, it doesn’t). The problem isn’t that some novels are trashy or have trashy elements, but that the term has been applied to all romances by the unknowing masses. “Trashy romance novel,” as generalized to the whole genre, is a “misnomer” if there ever was one. Ding ding ding! 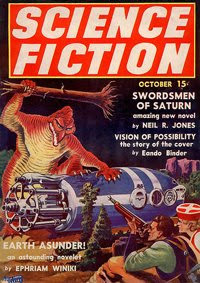 And in the same corner, we have the same people using the term “bad science fiction novel.” The genre has a reputation for being weird, not to mention campy, by non-SF fans. Past movies replete with poorly-executed special effects aren’t helping here. What the above demonstrates is that both science fiction and romance have something in common: namely, they are considered “ghetto” genres in some literary circles. The irony is that some of those circles involve fans of these very same genres. Picture science fiction as a glass house. Now envision romance as a glass house. Why, then, do they keep lobbying stones at each other? No book is perfect. And one woman’s trash is another man’s treasure where subjectivity reigns supreme. But let’s face it, there are elements of dubious quality in both genres that have plagued readers for decades, and authors would do well to avoid many of them if at all possible. We’ve learned much from the past as evidenced by hundreds of pretty darned sophisticated novels in both genres, but if we want to strike terms like “trashy romance novel” and “bad science fiction novel” from our lexicon, one way to start is to air the dirty laundry and have a frank discussion about the flaws. I’m not sure there’s an entirely straightforward solution, and certainly there’s not an easy one. I also wonder about how seriously readers feel about this issue—enough to make a conscious change? It’s difficult to believe so when certain snark-infested sites keep stoking the fires of discontent, but they aren’t representative of all readers and authors. • Exotic descriptions for the sake of being exotic (e.g., labeling ordinary items a “Zurg Volominator X1,” when it’s really just a toilet). Now, tell me what’s on your list. Can the right books change attitudes, or do you think we will be stuck with genre ghettoizing until the end of Time?